There are few places in this world that are as charming as the province of Krabi Thailand. The province, located in the South of the country is blessed by an array of world class natural attractions that range from hot waterfalls to limestone cliffs that rise high above pristine island beaches. 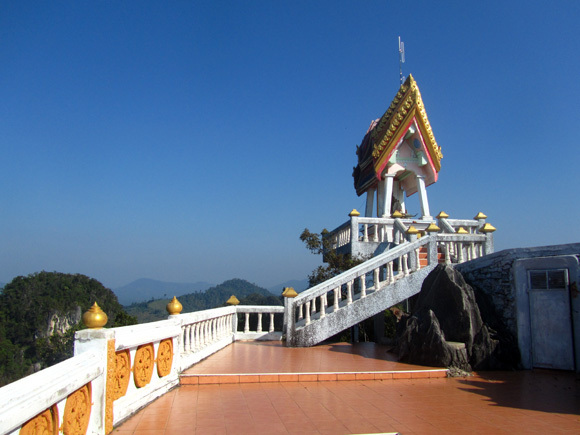 A trip to the province of Krabi is both rewarding, entertaining, and outright beautiful! Here are a few of what I think are the most incredible nature sites to visit in Krabi. Though tigers have long left the area, there's always that imagination at the back of your mind that a tiger might just leap out of the bushes at any moment and attack you. They label it as an “Unseen Thailand” attraction, so when I visited, in the back of my head I was expecting no one else to be there. Though a few others did show up, it was definitely not overrun by people to take away from the serenity and overall beauty of the place. 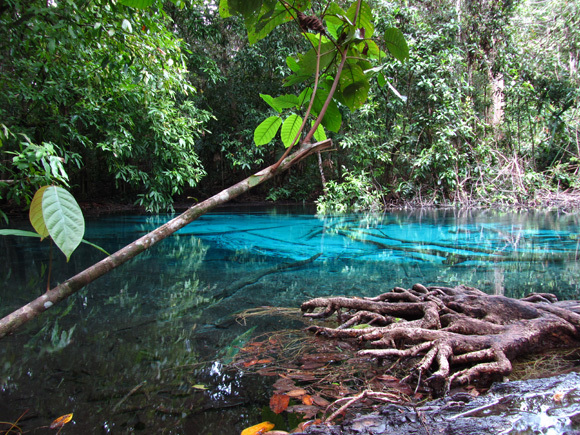 The Blue Pool was absolutely stunning, an opening in the thick tangled mangroves to unveil a hidden pure turquoise pool. I wanted to swim in the crystal water, but unfortunately there was a warning that the minerals could be harmful. Located in a bay that is secluded from the mainland by giant limestone cliffs, Railay Bay remains a picture perfect beach. 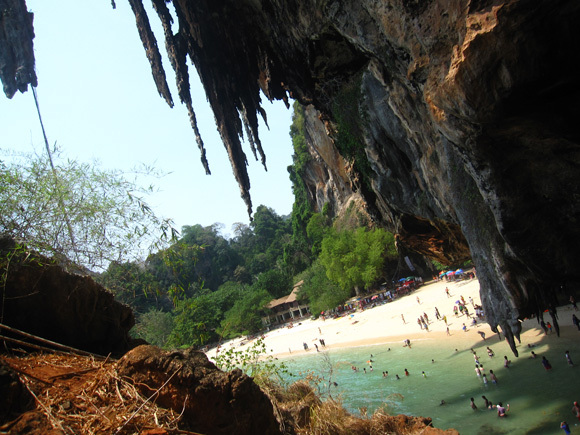 The jagged cliff walls and surrounding environment makes Railay a world class destination to rock climb or just an ideal place to relax, enjoy the beauty, and absorb the sunshine. For many it's the private islands and the pillars of limestone that emerge from the turquoise water that make Krabi a favorite destination in Thailand. Hiring a long tail boat for the day, cruising from island to island, stopping on stretches of white sand and taking dips in the warm ocean is an experience fit for royalty. 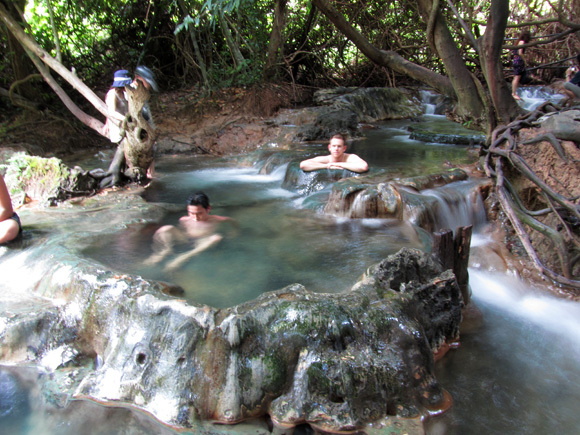 Take an already glorious hot spring of natural water, flow it down a shelf of rocks, and let the hot water pool up into compartments, and you have a hot spring water fall jacuzzi wonder. The hot water perfectly arranged into naturally created jacuzzi tubs is truly soothing on the body and I found it next to impossible to leave. 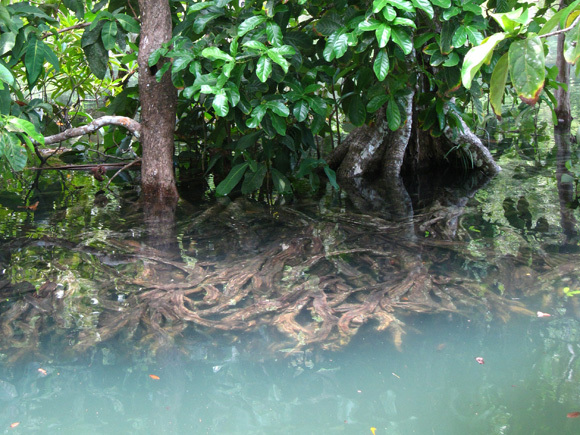 Located in a swamp on the edge of the ocean, the brackish water at Tha Pom Khlong Song Nam turns a series of different colors and levels of clearness depending on the ocean tide. Catch the tide at the correct time and the entire area turns into an outdoor aquarium of crystal clear water. The elevated wooden plank platform provides an incredible nature walk and and opportunity to view this natural phenomena from above. These are just an introduction to the incredible natural sites around Krabi that make it one of the most captivating places to visit in Southeast Asia. As the province of Krabi remains one of the more premiere jump off points for island hopping in Southern Thailand, sticking to the mainland also provides natural attractions that are equal to paradise. If you are a nature lover, taking the time to visit Krabi will surely be an inspiration! Take me those magical waters now!!! Sa Marakot (Emerald and Blue Pools) is just amazing! Southern Thailand is really one of the places I really want to visit! Great Juno! 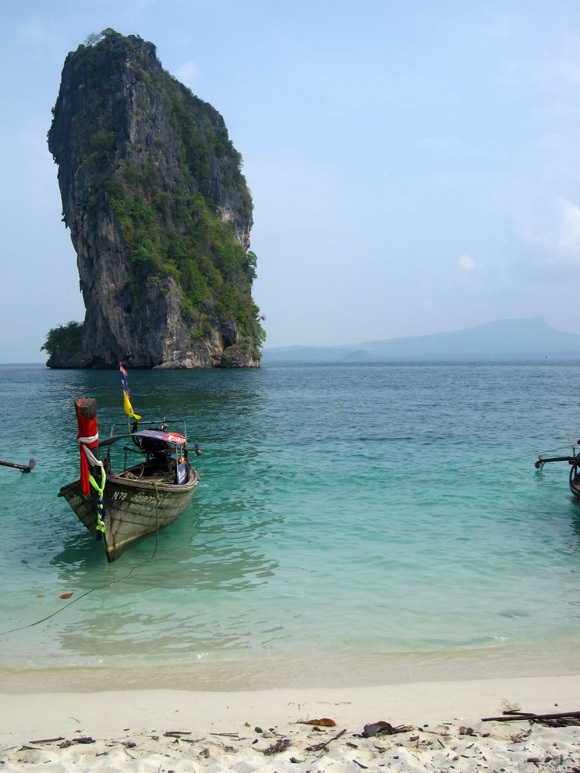 Krabi really is a magical place – I love it! Wow, these are truly crystal waters! Right on, it’s paradise on earth..
Definitely, so many beautiful places to see and go around Krabi! I’m going there on august. Cant wait! share your view with us. I’ve been looking at some of the posts on this website to get an idea about travel in Krabi for my next vacation.